We return to the farm and see Paw exiting his smokehouse. He wipes blood from his hands with a rag. His faces hardens with anger as watches the dust cloud stirred by Billy's truck approach the farm. Paw shuffles over to meet Billy. "You might have called your Paw if you had the mind to. Where'd you stay, boy?" he demands. Billy lowers his eyes. "I stayed with a friend." Paw's impatience intensifies. "You ain't go no friends in the city," claims Paw. "I do now," Billy snaps defiantly. Billy returns to the house in a huff. Billy sits down at the kitchen table. Paw places a plate in front of him. "Is that fresh meat? Did you get some more?" inquires Billy. "It was ready yesterday," Paw grumbles bitterly. "It probably tasted better last night." Billy tries to shrug off his father's smarm and pokes at his food. Paw interrupts Billy's dining by breaking into prayer. "Thank thee Lord for this food and for thy blessings. Bless our farm. Bless our crops. Keep us well. Bless this boy. Keep his evil doings in the past. Bless our Maw. Amen." The two eat without words. Billy finally breaks the silence. "You know that friend I was talking about? She's coming out here on Sunday to spend the weekend with us. Her and another. She's nice and purty � you'd like her. She's never been on a farm her entire life�" Paw growls, "You said you stayed with your friend � Boy ain't you ever gonna learn? You can't be around women! Crazy things happen when you get involved. Like what you did after your Maw died. Do you want me to send you up to your uncle's farm like I did back then?" Billy defends himself, "I KNOW I'm alright.' Paw raises his eyebrows at the notion. "That's what you said the night before last � and I wound up burying four girls yesterday. Billy, don't you understand? I've got to watch out for you. Your Maw made me promise that no matter what, it's just you and me. There can't be nobody else." Billy rises from the dinner table. "Sherry's a nice girl! She likes me. She's coming out here this weekend. And if you don't like it you can just go to Aunt Josie's or something." Paw becomes very sincere. "If this Sherry means so much to you, why do you want to kill her?" Billy becomes agitated and explodes. "I'M NO KILLER! DO YOU HEAR ME? I'M NO KILLER!" He runs away from the kitchen table and rushes outside. The word 'killer' echoes in his mind and in the film's soundtrack. "KILLER, KILLER, KILLER, KILLER, KILLER, KILLER, KILLER, KILLER!" Billy collapses into convulsions on his lawn. "KILLER, KILLER, KILLER, KILLER, KILLER, KILLER, KILLER, KILLER!" Morning arrives and brings with it a much-needed wardrobe change for Billy. He goes outside to perform his daily farm tasks, which include pitching hay and cleaning up barns. In the meantime, Paw creeps around his locked smokehouse suspiciously, making sure to keep an eagle's eye on Billy's whereabouts. It's suddenly later that night, and both father and son dine on more of Paw's prized meat. Billy broaches the Sherry topic again, this time with unwavering firmness. "Paw, I want Sherry here on Sunday. You don't have to stay here if you don't want to." The two men exchange icy stares then continue to eat in silence. The following morning, Billy waits on a flowery hill for his guests to arrive; he's wearing another outfit thankfully enough. Superimposed over a shot of the girls' approaching car, we hear Sherry's voice say, "Hi Billy. Billy, this is Becky." Another voice says, "It's nice to meet you." Sherry continues, "This place is gorgeous. It's really something else." After a bit more field frolicking, Billy brings the babes back to the house. Paw is there to meet them, but he's stumbling and visibly intoxicated. "Aren't you gonna introduce me to your friends?" Paw asks. He sizes up the ladies salaciously. "You shhhure know how to pick 'em, Billy boy!" (And really, Paw brings up a good point. 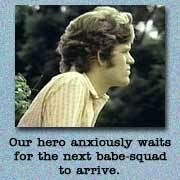 Billy has now managed to lure six babes -- five of them nudists -- to his house in the span of four days.) Billy becomes irritated with his father's rudeness. "You're drunk!" Paw stumbles toward him and slurs "I'm not drunk, and don't be disssss-respectful to your father!" Sherry senses trouble and politely suggests that she and Becky return to their rooms to freshen up. They leave Billy behind to deal with Paw in private. Sherry relaxes on the bed while Becky fixes her hair. "Sherry, do you love him?" Becky quizzes. Sherry grins with embarrassment. "I don't know � we've known each other only a few days." Becky adds, "He loves you." Sherry is taken aback. "How can you tell?" Becky straightens up in her chair and suddenly glows with sincerity. "The way he looks at you � he reminds me of someone. Someone I knew a century ago. It was summer and I was a camp counselor for a group of little girls. He was a medical student and one day he came by to give us a lecture on first aid. He spoke to us for ten minutes on the importance of first aid. He said, 'Now girls, I want to show you what a real first aid kit looks like.' Only he couldn't because he'd forgotten to bring it. I'd never laughed so hard in all my life. My mascara even ran!" At this point, Becky amazingly turns her attention to the camera, completely ignoring Sherry. While staring directly at YOU, the viewer, she continues her unsolicited sappy love saga. "That night I sneaked away from camp and we had our first date. Then a month later we were married. Oh, that was a wonderful summer. Each hour was a day in heaven." Becky pauses sadly before again addressing the lens. "Then they sent him an invitation to die in one of their wars. Then they sent me a telegram that he had. They were only half-right. I died, too." For emphasis, Becky turns to face Sherry. "Take all the happiness you can. At best, life's a short ride, and it isn't always round trip." 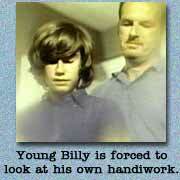 (3) Young Billy was played by Smith Haynie, script supervisor Lois Haynie's son. He's actually very convincing as the "younger version" of James Pickett.